Most orthodontic patients wear braces as a major part of their treatment. Now there are many variations and types of braces. We will explore the options here that you have for orthodontic appliances. To begin with, there are fixed and removable appliances. Fixed appliances like braces are bonded to the teeth by bands or cement. They stay on until the treatment is finished. Removable appliances, like clear aligners, are worn for 22 hours each day and can be easily removed. Fixed appliances are used for more comprehensive treatments whereas removable appliances are successful for fixing mild orthodontic problems. Traditional metal braces are composed of stainless steel. They continue to be the most used type of orthodontic fixed appliance. These braces consist of metal bands that surround the back molars. In addition, metal brackets are bonded to the outsides of the teeth. A fine metal wire connects the brackets and moves the teeth into alignment. Elastics, metal ties, and clasps bond the wire to the brackets. 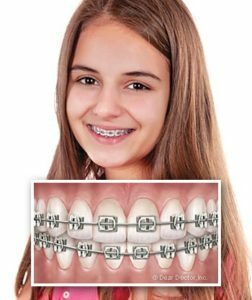 Metal braces remain the most common orthodontic appliance because they are reliable, effective and fairly inexpensive. 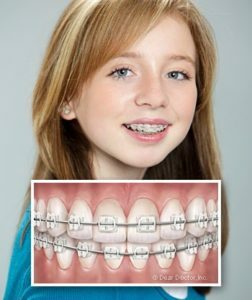 As compared to the old fixed appliances, the current braces have reduced in size, weight, and feel better in your mouth. You can customize your appliance with alterations like colorful elastics for brackets. Clear ceramic braces are similar to metal braces, but the brackets blend in with the color of your teeth so they are less noticeable. The ceramic braces have brackets that are composed of a translucent ceramic material that matched the color of your teeth. Adults prefer this appliance because it’s hard to notice them unless you look closely. A variety of ceramic braces are offered and the appliance is continually evolving. While they look great, there are a few tradeoffs. Ceramic brackets are weaker than metal brackets. Furthermore, the brackets do not stain, but the elastic bands that join the brackets to the wire do stain. The elastic bands are replaced monthly. Ceramic braces come with additional cost. Many people would prefer to have less noticeable braces and pay a small additional cost. There is one appliance that is truly invisible, called lingual braces. They are on the inside of the teeth surrounding the tongue. Lingual braces follow the same correcting processes as normal braces, but the beauty is that you cannot see them. The teeth cover the whole appliance. 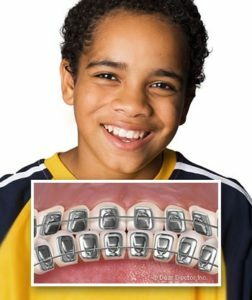 Lingual braces only fix certain orthodontic conditions. The orthodontist must have specific training and they cost a far greater amount than standard braces. They have a longer adjustment period to feel comfortable wearing them. Also, the treatment takes longer. However, lingual braces may be an option for you if your treatment works with them and you want the least noticeable fixed appliance.